Twelve Kino Teens chapters throughout the U.S. work to educate others about immigration issues and advocate for migrants within their communities. Here, at this year’s Walking in Mercy Youth Summit, Kino Teens from high schools in southern Arizona came together to discuss these topics more deeply and to share their experiences. Yanula Avila Kyriakis first encountered the KBI as a student at Lourdes Catholic School in Nogales, AZ when her parents became involved in the KBI’s work, and later joined the Kino Teens chapter at Salpointe High School in Tucson. 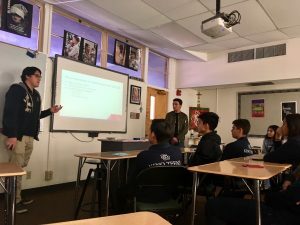 Now a senior at Santa Catalina High School in Monterey, CA with plans to study international relations at university, Yanula interned with the KBI this past summer, writing a helpful guide for students who are interested in starting a Kino Teens club at their school. Here are her thoughts about this KBI-sponsored youth organization and the role young people can play in advocating on behalf of migrants. These days when you turn on your TV, you hear about children being torn from their parents at the border; you want to make a difference, but how? Many teens today may want to get involved in their community or in the larger world. The KBI’s Kino Teens offers a way to do that. The Kino Teens is a group of students that works to raise awareness about the migrant issues at the border and seeks to promote social justice for migrants. To address the crisis happening in our own backyard, we shine a light on this truly important and pressing matter. Growing up on the border, I never thought about the implications of moving from one world to another—it was simply a part of my routine. I heard stories of people who left everything in their hometowns to provide for their families and escape violence or extreme poverty. Before I joined the Kino Teens as a high school freshman, I lived in my own world where my worries and problems seemed dire, but after talking to the migrants I realized I live an extremely privileged life. My problems and worries seemed frivolous compared to not knowing if you will make it alive across the border or wondering if you will ever see your loved ones again. Suddenly, social media likes were insignificant compared to worrying about how you were going to make a living. Working with the KBI, the Kino Teens helps educate and inform the future generation of students who can then make a difference with what they learn. The direct experience of hearing migrant stories and accompanying them can inspire students to wake up and defend the rights of these migrants—advocate for them, act as their voice, and fight for social justice on both sides of the border. Writing letters to local representatives and meeting with them are a couple of the ways the club tries to meet these goals. Through my participation in the Kino Teens, I have grown in compassion for migrants and their cause. As Humberto points out, you don’t have to live on the border to contribute to the cause. It is becoming increasingly important that schools everywhere across the U.S. start their own chapters. Imagine how this would increase the strength of our voices! So far there are twelve schools that have gotten on board and, if this number keeps increasing, the impact of the Kino Teens can be enormous. I believe it is my generation’s responsibility to stand up for this issue. Immigration has become a prominent issue in our world today. There are many powerful and important people voicing their opinions about how they think the U.S. should handle this crisis. However, it seems like almost none of these people know what a migrant experiences from day to day. Many are not aware of the harsh, sometimes even cruel, conditions migrants face when detained, or the lack of respect for human dignity they experience. Hopefully, Kino Teens members will one day one be among these influential people; they will know more about the migrant experience and work to make meaningful change. That is what the Kino Teens strives for, and that is why it is so important for the club to grow—it is our responsibility. If you are interested in starting a Kino Teens chapter at your school, here is a guide. Very proud of Yanula Avila and young people of th Kbi teens, keep up the good work , immigrants suffer injustice in a daily basis . Makes me very proud to see good young consius teens participating to make this a better and more fair world for the less fortunate. Keep up the great work Yanula! We are so proud of you! It is so important that the younger generations to get involved in such a great cause. I hope your example and message reaches many teenagers throughout the country! !